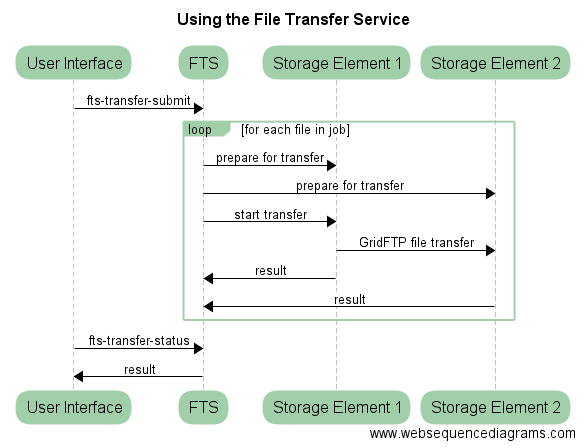 This page includes the basic commands to use the FTS (File Transfer Service). For an overview of storage clients, see Storage clients. FTS3 is a file transfer service for reliable file transfers across sites or else, third party transfers. You cannot use it to transfer files from your local machine to dCache and vice-versa. FTS3 service has been running for years. It was developed by Cern for WLCG data transfers up to petabytes per month. From the user perspective, it allows data movement, retrying if necessary, monitoring and displaying usage statistics, see FTS3 wiki. From the operations view, it optimises resource usage. The wisdom of FTS is the Optimiser which decides whether to increase or decrease the amount of transfers attempted at a time. It evaluates any symptoms of saturation and decreases the number of parallel transfers when there is an increase of recoverable errors, or the throughput worsens. FTS3 has a REST API and supports several transfer protocols, such as: GridFTP, SRM, Webdav, HTTPS. Our FTS instance can be found at: SURFsara FTS UI. The site can be accessed when you have a certificate installed in your browser. The FTS UI provides a sophisticated and easy to use web interface for transfer management and monitoring. The SURFsara FTS Rest API be used from command-line clients or the web-interface version (SURFsara WebFTS), or python bindings. The Cern website offers several examples to interact with the API with python, see FTS Easy Bindings. The FTS command-line client is currently installed on the UI ui.grid.sara.nl. To use the FTS you need to create a local proxy. The fts submit command automatically delegates the proxy to the FTS server. The default lifetime is 12 hours. This means that you need to submit an fts command at least once every 12h to renew the delegation, e.g. by checking the status of the transfers with an fts-transfer-status command. When the remaining lifetime of the stored proxy passes under 4 hours, fts-transfer-submit will automatically delegate a new one as long as there is a valid local proxy. To run the examples in this page you need to have a valid local proxy. The voms-proxy-init tool can be used to generate a proxy with VOMS attributes from the personal certificate. Alternatively, you can use the startGridSession tool available on the SURFsara UIs. See also Starting a Grid session. The fts-transfer-submit command submits transfer-jobs by specifying the source and destination file location. The file location can be a SURL, TURL or HTTPS link. For efficient usage of the service, it is preferred that the source and destination endpoints are GridFTP or SRM servers. The output of the submit command is a unique ID that can be used for tracing the transfer status. When the FTS transfer starts, it creates the target file with 0 bytes. If the transfer fails the target file is removed independent to the amount of bytes that had already been transferred. We have noticed that using SURLs instead of TURLs slightly increases the performance (due to the SRM load balancer). -s https://fts3.grid.sara.nl:8446: specify the fts server. -K: enable checksum. By default, adler32 is supported on the SURFsara servers. Combinations between TURLS, SURLS, HTTPS and SRMv2 are possible. More information and examples of bulk transfers and FTS in general can be found at CERN FTS3 documentation. Provided that you have a valid certificate installed in your browser, you can submit your file jobs to different endpoints via a web interface, the SURFsara WebFTS page. Please note that the service is still in Beta phase and we advise you to contact us before using it. At the moment any jobs are visible to anyone under any VO, but this can be closed by our system administrators upon request, just contact us at helpdesk@surfsara.nl. In case that you monitor any failed transfers, then once the bulk transfer finishes, collect them and resubmit only the list with the files that failed.